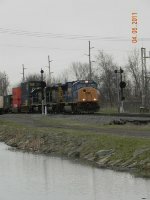 Title: 381 - SD40-3 4004 and 4005 in the siding at Reusens on Q30212! Description: An EMD SD70MAC and the rarely before seen EMD SD40-3 rebuild are the leaders on this westbound intermodal train passing through Connellsville beside the Q261 autorack train. What a shame that the 4004 was not on the front. Description: CSX SD40-3 4004 and CSX SD70AC 4786 trail on Q174-22. 4004 was rebuilt from SD40-2 8021. Description: Camp Meeting Ave, 1919 hours. Description: Second of the SD40-3's to be leading Q235 this week. 4012 was leading Q235 on Monday 5/9/11. Description: blt as L&N 8021 in 1979, later CSX 8021. Description: CSX SD40-3 4004 leads Q235 (Louisville Ky. to Tampa Fl. autoracks) along West Railroad Avenue. CSX 7796 is trailing. Description: CSX 4004 THIS IS THE FIRST TIME I'VE SEEN ONE OF THESE. NOTE THE PLATFORM ON THE REAR? Description: CSX 494,4758 AND 4004 HIT GRIDLOCK IN MANCHESTER.